I would like to do something with this part of the yard, under the black walnut tree. Most plants can't live under black walnuts because the tree produces juglone. I've been hunting around plant lists to find some shrubs to start getting them established this spring. East Multnomah Soil and Water Conservation District (EMSWCD) has an annual native plant sale. This year's sale just opened up for orders yesterday and most of the plants are only $3. I ordered shrubs that are supposed to survive under black walnuts: Vine Maple, Mock Orange and Red Stem Ceanothus. 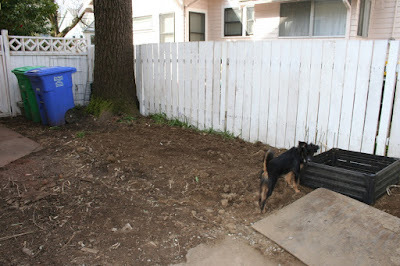 I also ordered an extra Vine Maple to replace the overgrown mystery bush we took out to make way for the French drain in summer. We bought many of our original rain garden plants from EMSWCD, but sadly they don't sell ferns and flowers anymore. We'll have to visit some of the other local nurseries to pick up smaller plants. I've also started shopping for some vines to plant on the pergola. While I'd like to buy grape vines, I suspect we're going to end up with kiwi because grapes are poisonous for dogs to eat. My hosta do great under my black walnut trees. My roses didn't do well and they were in the sun and not directly underneath but they died anyways as did two magnolias. I wanted to thank you! Had you not told me about the sale I wouldn't have been able to get in on the deal. I picked up my picks today!! So thank you! !